Being a money-making mom has changed my life and the life of my family. In three years time, I went from being a stay-at-home mom who could barely afford it, to achieving seemingly impossible goals through my at-home business. If you’re on the fence about whether or not to start a business of your own, you might want to consider these 5 reasons to become a money-making mom. 1. To get off government aid. This one might not apply to you, but many American families have kept afloat financially with the help of government assistance since the 2008 recession. I know because our family was one of them. I don’t condemn the use of government aid, but I also don’t condone it as a lifestyle. Growing up in the upper middle class in suburban America, I never dreamed my family would one day be barely making it and supplementing our meager grocery budget with WIC checks… but for three years, we did just that. Becoming a money-making mom afforded us with the income needed to support our family without the use of government aid. The day I called the WIC office to cancel our checks was monumental! 2. To pay off debt. I’ve witnessed many friends crippled by the weight of massive credit card bills and student loans. Even families with sizable incomes are often burdened with so much debt that they can barely make ends meet each month. Becoming a money-making mom can help your family pay off debt faster! 3. To give your family breathing room. Even if you’re not at poverty level and don’t have debt, many families are still at the point of not having much breathing room after all the bills are paid. Perhaps you simply want to increase your grocery budget, so you can eat more quality food. Or maybe you want enough margin in your budget for little splurges. Having some “mad money” can actually help keep you from overspending. Being a money-making mom can provide for those extras that your primary income might not afford. 4. To provide for your children’s educations. The number one reason I started my blog in 2011, was because I dreamed of one day sending our then-2-year-old to a university-model school in our town. Since we were living on a low income at the time, this seemed like an unattainable goal, but, still, it was worth a shot. Fast forward a few years, and not only were we able to send our little girl to this school for kindergarten (and now for first grade), but we were also to pay the entire year’s tuition in cash! Being a money-making mom can provide for homeschool curriculum, private school tuition, or even help fund college savings accounts! This is my absolute favorite perk of being a money-making mom. In three years’ time, we went from barely making it financially to being able to give more than we ever dreamed possible. Not only that, but this past summer we were also able to take a family mission trip, where we were able to help with some community outreach projects and an Operation Christmas Child distribution. One of the first charities my business was able to give to was Hope 4 Women, International, a program that helps impoverished widows and single mothers in 3rd-world countries become money-making moms themselves! Notice that, of the five reasons I listed, I did not include “getting rich” or “becoming famous” as reasons to become a money-making mom. Money is not evil, but the love of money is the root of all evil. Life is more than money, and to simply make more of it for the sake of getting rich or becoming famous will leave you empty-hearted. The heartbeat behind Crystal’s book, Money-Making Mom, is that women can learn how to earn more money in order to make a difference in the lives of others. That is the essence of becoming a money-making mom. Erin Odom is the creator of The Humbled Homemaker, a blog about motherhood, healthy living, saving money, and homemaking. After losing her home and surviving on government aid for three years, she is passionate about extending grace to families who are struggling and helping others see there is hope at the end of financial troubles. This was a great list and the reasons I wanted to work for myself. Thanks so much for putting this together Erin! Thank you, Danielle! I hope you see your dreams realized as a money-making mom as well! #3 and #5 are definitely my biggest motivations for starting to work from home. I have been home as a stay at home Mom for 10 years and never made a dime. I will be honest and say that I didn’t care to for a long time. I just thought I should be able to do this and it should just all work out. While we haven’t been completely strapped, (my husband works hard) we have had to be frugal in many areas. I don’t make money, yet, but I hope that my hard work will pay off sooner than later. I hope your hard work will pay off too, Rosanna! Thank you for sharing, Erin! My main goal this year is to make enough to send my son to preschool in the fall. You are so inspiring and I love that my goal is in-line with one of your goals! I think that is a wonderful goal, and you might just be surprised but I bet you will exceed it!! This is a GREAT point, Keelie! I love that reason so much as well! Writing and connecting with other women (what my wahm job entails) feeds my soul! #1 and #2 are the big ones for me for sure. My daughter and I just went on state health insurance. I hated having to go that route but with the increase of my husband’s health insurance plan (it has gone up a total $40/week since 2012), we no longer could afford to pay our bills let alone get ahead. $40/week may not sound like a lot to some people but on one rather small income, it makes a huge difference. I have a major goal of being able to make enough each month to cover the groceries/household stuff so that money is freed up to get us back on my husband’s health insurance plan and have money to pay down debt. I love your goals, Julie! And I totally know what you mean about $40 being able to break your budget. We were there when I started blogging. I hope you reach your goals beyond your wildest expectations! 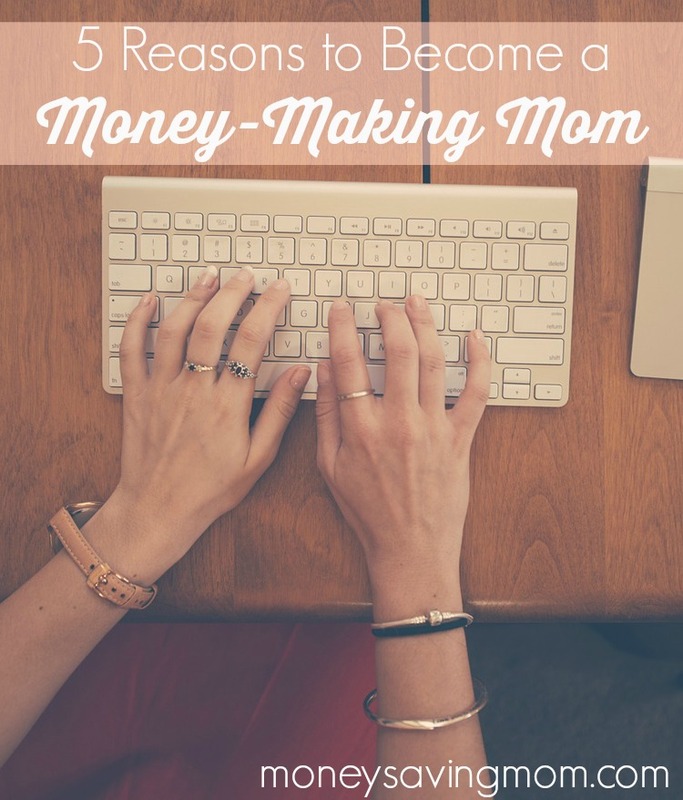 Such a great list of reasons to become a money-making mom! As someone who also works from home, I would have to add that one of my favorite aspects of what I do, is showing my kids that there are other ways to earn an income, aside from a traditional 9-5 job. It inspires me to see all of the different ideas that moms (and dads) are coming up with in an effort to be at home with their children, while also making money. That is a great point, Sharon! It inspires me too! I have no idea what I could even do! How does one figure that out? I don’t have any sewing skills our anything like that. The sky is the limit! I blog for a living. Start out with your passions, interests, and talents, and go from there! I would start with your passions and talents and go from there! The sky is the limit! I make an income from blogging; I am not crafty at all! I’m convinced! I ordered the book today. I’m not a mom yet, but I am actively trying to make some extra income from home in addition to my regular job. We’re in a transition period right now while my husband works part time and goes to school full time. This summer he’ll graduate and finally work in the field he wants to be in! I’d LOVE to be able to quit my job and work from home some day. For now my goal is to make some extra money that will make it possible for us to travel a little! You are SO wise to start brainstorming ways to make money from home NOW, before you are a mom! You will be all set when the time comes! I wish that I could somehow be a money making mom. I am struggling with each of the things on your list, and I’m in my mid 30’s and feel like hope is dwindling. I often come to the conclusion that I am not as clever or energetic or talented as many of you ladies who have figured out how to earn money from home while being a wife, mom and homeschooler. Part of it is that I can’t bring myself to do any of the multi-level marketing things (essential oils, wraps, Avon etc) that are all the rage right now because they’re not my thing at all. I could not pretend to believe in these products/ selling techniques, while it may be fine and great for others. But what is really my struggle is that what’s already on my plate with being a wife, mom and homeschooler is already overwhelming to me, and I truly feel that I have zero margin if I want to do an adequate job at these things. My hope is that God can somehow make a way for me to do the impossible (make an income from home), or understand where I am and help me endure the grief of not being able to meet any goals for the greater good of being able to do the primary things on my plate. I’m so sorry you are discouraged, Cate. If it’s an encouragement to you, I want to share that I am not into MLMs either. A lot of my friends have found their money-making venture that way, but, like you, it’s just not me. I have zero desire to go that route, and I think I would be miserable if I did! I would encourage you to think about your natural gifts, passions, talents and go from there. I have always loved to write, so blogging was a natural money-making venture for me to take. I hope you will find some encouragement today. Don’t beat yourself up; give yourself lots of grace, Mama! Kate, I can totally identify. I have 4 kids, I homeschool 3 of them, and it feels overwhelming just to do that and keep up with the house. I am not making any money right now but am looking into ways that would fit my personality and life situation. Right now I am in the research and learning phase, and try to use a couple of hours a couple of times a week in the evenings (my husband watches the kids) to work on skills mostly and get a feel for what I like. It’s hard because I’m not making money yet, but I am learning what I like and what I have vision for (or don’t). If I were in your shoes, I might start first with just trying to find an hour a week to work on something I’m interested in – no pressure to earn money from it, just to do do what I’d like to do. For me, it’s sewing, and while I do it I try to listen to podcasts on working from home (Brilliant Business Moms is one, I also love Abby Glassenberg’s While She Naps podcasts). I don’t always have the same life issue that the people featured in these podcasts do, but it’s good to just think about it when I can. We are in the situation where it would really help for me to earn some extra money (student loans to pay off), but if you are able to live frugally and don’t have a pressure to earn money, I would just focus on your kids and homeschooling if that’s what you feel led to. Thanks so much, ladies. I talked to my hubby last night and in the process was reminded that I definitely do have passion and talent. I guess I just get so bogged down with how simply time consuming full-time motherhood is, AND comparing myself to others. What I’m good at, and passionate about isn’t something that’s necessarily the norm, or profitable, actually. And I’m the type who is frustrated by the results of not having enough money, but I don’t care enough about money to chase after it. So I might as well do what I enjoy for the sake of being how God made me. Hubby reminded me that I’m important and we can make time for what I love because there’s a lot of value in that in itself. I know what you mean Cate! I just started a blog and I already feel like I don’t have enough time to do it. It kind of stresses me out and I’m afraid my family will suffer because of it. But on the other hand, I also really love doing it. Does anyone have any work they do online, that doesn’t involve being on the phone. I am a military spouse, and stay at home mom of three, with one of them in school. It’s too expensive for me to put both of my youngest little ones in daycare and I need something to make extra money from home. If you have anything that is NOT a scam and would truly help me, I would really appreciate it. Hi Marissa! If you do a quick search for “work-at-home mom opportunities” here at Money Saving Mom, you should find some of Crystal’s resources. There are a lot of viable options. I blog for a living. If blogging isn’t your cup of tea, you might consider trying to be a virtual assistant (think: online secretary) for a blogger. Bloggers usually need a LOT of help, and being a virtual assistant usually requires you to be on the computer but not the phone! How would someone go about doing something like that? I would be interested as well. My husband is one of the associate pastors at our church and also works a full time plus overtime job. I am a stay at home mom and planning on homeschooling. I am expecting our 4th baby and the other 3 are all under the age of 4. My time is very sparse and I don’t think there’s any way I could start a blog or any kind of business at this time in my life. I am also not interested in selling a product. If there was some kind of online work I could do for just a few hours a week it would be so nice. My husband has a lot pressure on him and I would love to be able to help relieve it. Great post, Erin! I just started a blog as a ministry (and hopefully money making project.) It’s so hard for me to balance the idea of reaching other women’s hearts and encouraging them in their walk with the Lord with the concept of making a profit. I would love to connect with you and get a little advice on growing a blog with both goals. I have some resources on my blog that I would love to share with you, Christina! Please email me at thehumbledhomemaker at gmail dot com, and I will send them your way! Some of the reasons you’ve mentioned are why I don’t give up on making money from home. Great post! Thank you, Jill! I have always loved your blog! Hi Lisa! I’m sorry I missed this before. Crystal has a ton of resources here: https://moneysavingmom.com/make-money-blogging and I also have my favorite resources here: http://thehumbledhomemaker.com/pick-my-brain. Best wishes on your new venture!! Thank you, Vanessa! You never know what God has planned!